Ernst Haeckel was best known for the famous statement "ontogeny recapitulates phylogeny", he also coined many words commonly used by biologists today, such as phylum, phylogeny, and ecology. On the other hand, Haeckel also stated that "politics is applied biology", a quote used by Nazi propagandists. The Nazi party, rather unfortunately, used not only Haeckel's quotes, but also Haeckel's justifications for racism, nationalism and social Darwinism. Haeckel said: "I established the opposite view, that this history of the embryo (ontogeny) must be completed by a second, equally valuable, and closely connected branch of thought - the history of race (phylogeny). Both of these branches of evolutionary science, are, in my opinion, in the closest causal connection; this arises from the reciprocal action of the laws of heredity and adaptation... 'ontogenesis is a brief and rapid recapitulation of phylogenesis, determined by the physiological functions of heredity (generation) and adaptation (maintenance). '"Haeckel, E. 1899. Riddle of the Universe at the Close of the Nineteenth Century. Seen here is the original fraudulent drawing by Haeckel in 1874 that is used in biology text books in the current school year. Textbooks (copyrighted this year) use his fraudulent drawings knowing they are false! University professors use Haeckel's drawings knowing they are untrue. "The Piltdown man of Genetics"
Evolutionists says, "There's no evidence of creation in the human embryo. Otherwise, why would a human being have a yolk sac like a chicken does and a tail like a lizard does? Why would a human being have gill slits like a fish does? An intelligent creator should have known that human beings don't need those things." Abortionists say, "the fetus is still in its fish stage so you are just cutting up a fish" today to convince young women that killing their child is acceptable. Points out "gill slits" in human embryos. Suggests Haeckel made mistakes but was partly right. Represents early embryos as looking the same like Haeckel did. Says that although the Haeckel drawings were wrong, that there are still clear similarities in early embryos, when in fact there are almost no similarities. Uses revised drawings that don't illustrate any visual similarities in embryos, then continue to argue that early embryos are proof of evolution because of their similarities. Presents the "biogenetic law", Haeckel, or his work in any positive light without also exposing his scientific crimes. Pitman: "To support his case he [Haeckel] began to fake evidence. Charged with fraud by five professors and convicted by a university court at Jena, he agreed that a small percentage of his embryonic drawings were forgeries; he was merely filling in and reconstructing the missing links when the evidence was thin, and he claimed unblushingly that hundreds of the best observers and biologists lie under the same charge." (Adam and Evolution, Michael Pitman, 1984, p. 120) NOTE: " to our knowledge, no respectable historical source mentions this conviction of Haeckel, we conclude that the claim for it must be based on hearsay, not fact." (SCIENCE, K Sander & R Bender, July 17, 1998) However even if the conviction story is untrue, he should have been convicted and deserved to be. Haeckel created the Piltdown man of embryology. Fleischmann 1901 A.D.: Another scientist, who at about the same time also protested against Haeckel's fakes, was Albert Fleischmann (Die Descenddztheoried, 1901, pp. 101-152). Thompson: Haeckel, who in 1868 advanced this "biogenetic law" that was quickly adopted in textbooks and encyclopedias throughout the world, distorted his data. Thompson explains: "A natural law can only be established as an induction from facts. Haeckel was of course unable to do this. What he did was to arrange existing forms of animal life in a series proceeding from the simple to the complex, intercalating [inserting] imaginary entities where discontinuity existed and then giving the embryonic phases names corresponding to the stages in his so-called evolutionary series. Cases in which this parallelism did not exist were dealt with by the simple expedient of saying that the embryological development had been falsified. When the `convergence' of embryos was not entirely satisfactory, Haeckel altered the illustrations of them to fit his theory. The alterations were slight but significant. The `biogenetic law' as a proof of evolution is valueless." W. R. Thompson, "Introduction to The Origin of Species," p. 12. Stephen Jay Gould: "... it has fascinated me ever since the New York City public schools taught me Haeckel's doctrine, that ontogeny recapitulates phylogeny, fifty years after it, had been abandoned by science." (Ontogeny and phylogeny, Stephen Jay Gould, ISBN 0-674-63940-5, 1977, p1) Stephen... Nothing has changed for students today! What will you do about it? Ehrlich and Holm: "This generalization was originally called the biogenetic law by Haeckel and is often stated as `ontogeny recapitulates phylogeny.' This crude interpretation of embryological sequences will not stand close examination, however. Its shortcomings have been almost universally pointed out by modern authors, but the idea still has a prominent place in biological mythology." Paul R. Ehrlich and Richard W. Holm, The Process of Evolution (New York: McGraw-Hill, 1963), p. 66. Gavin R. deBeer: "The enthusiasm of the German zoologist, Ernst Haeckel, however, led to an erroneous and unfortunate exaggeration of the information which embryology could provide. This was known as the `biogenetic law' and claimed that embryology was a recapitulation of evolution, or that during its embryonic development an animal recapitulated the evolutionary history of its species." Gavin R. deBeer, An Atlas of Evolution (New York: Nelson, 1964), p. 38. Gavin R. deBeer: ". . . the theory of recapitulation has had a great and, while it lasted, regrettable influence on the progress of embryology." Gavin R. deBeer, Embryos and Ancestors, revised edition (London: Oxford University Press, 1951), p. 10. Walter J. Bock: "Moreover, the biogenetic law has become so deeply rooted in biological thought that it cannot be weeded out in spite of its having been demonstrated to be wrong by numerous subsequent scholars." Walter J. Bock (Department of Biological Sciences, Columbia University), "Evolution by Orderly Law," Science, Vol. 164, 9 May 1969, pp. 684-685. Frings: ". . . we no longer believe we can simply read in the embryonic development of a species its exact evolutionary history." Hubert Frings and Marie Frings, Concepts of Zoology (Toronto: Macmillan Publishing Co., 1970), p. 267. Waddington: "The type of analogical thinking which leads to theories that development is based on the recapitulation of ancestral stages or the like no longer seems at all convincing or even interesting to biologists." Conrad Hal Waddington, Principles of Embryology (London: George Allen and Unwin Ltd., 1956), p. 10. Thomson: "Surely the biogenetic law is as dead as a doornail." Keith Stewart Thomson, "Ontogeny and Phylogeny Recapitulated," American Scientist, Vol. 76, May-June 1988, p. 273. Montagu: "The theory of recapitulation was destroyed in 1922 by Professor Walter Gasbang in a famous paper. Since then no respectable biologist has ever used the theory of recapitulation, because it was utterly unsound, created by a Nazi-like preacher named Haeckel." Ashley Montagu, as quoted in Sunderland, p. 119. See our outline on Homology, since this is ultimately what the embryonic argument is today. Haeckel fraudulently draw embryos in the "tail bud" stage to be almost identical for different species. Heterochrony is falsified because in some species of direct developing frogs, and in monotreme mammals, limb buds are already present at the tailbud stage, whereas in other species, these are not seen until significantly later. Human embryos have tiny protrusions called limb buds, particularly if they have developed to the point of having as many body segments as Haeckel gives them. But Haeckel did not include limb buds. Birds are characterized by their prominent mesencephalon. Whereas most amniote embryos have a heart by this stage. The chick embryo eye is blackened, like a mammal's, although it wouldn't be pigmented that early. Haeckel gave the bird embryo a curl in the tail that resembles a human's. 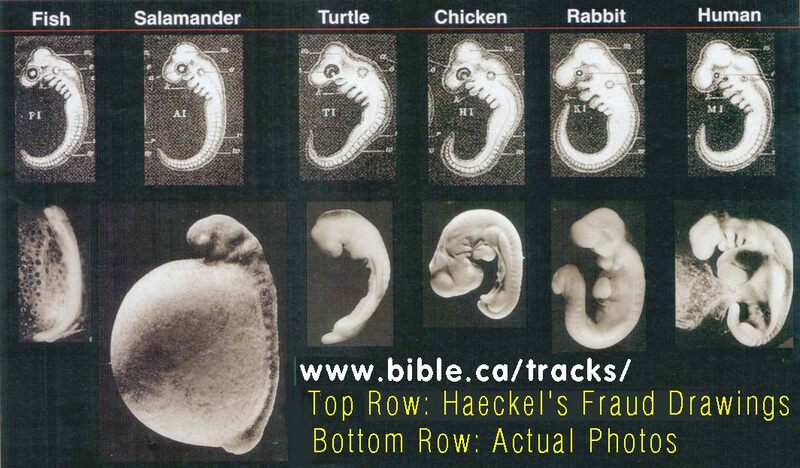 Haeckel also falsified the size of each embryo to be the same when in fact there is a huge difference in size. The scorpion fish embryo is 700 microns long at the tailbud stage, while the mudpuppy salamander measures some 9 millimeters. In 1868 Ernst Haeckel creates the fraudulent theory. He created drawings of several embryos by copying several he falsified by copying embryo copied from other works. The drawings were placed in Romanes' 1901 book called "Darwin and After Darwin". Haeckel's drawings are reproduced widely in English language biology texts to this day. In 1997, Michael Richardson (embryologist at London's, St. George's Hospital Medical School) exposed Haeckel's fraud in a published paper called "Anatomy and Embryology", Vol.196 (2), pp 91-106. he shows that the early embryonic stages of 39 different creatures including the fish, the turtle etc., are nothing like the same. Richardson and his colleagues compared the embryos of 50 vertebrates to Haeckel's drawings. They say that Haeckel left out some features, such as the budding limbs that some embryos have, while adding others, such as an excess of vertebra-like "somites". Dr. Michael Richardson called Hackael's biogenetic law as "one of the worst cases of scientific fraud". The best use evolutionists can make of embryology is the weak argument of homology. They point to similarities in embryos and argue these similarities are the result of a common evolutionary ancestor. However, similarity is just as strong, if not stronger proof of a common designer, like God. The earliest events leading from the first division of the egg cell to the blastula stage in amphibians, reptiles and mammals are shown to be dramatically different. Top row is Haeckel's original work of 1874. Drawings of Michael Richardson of selected embryos shown at the "phylotypic" stage. (G) brush-tailed possum (marsupial mammal, Trichosurus) where there is (in contrast to the cartilagenous fishes) large maxillary and mandibular processes. Evolutionist argument: "High school biology (or any other) textbooks are usually several years out of date, given that authors of high school texts are not usually themselves front rank research scholars. These scholars rarely write university-level textbooks if they write any at all." Evolutionist argument rebutted: This is an open admission by evolutionists that high-school level textbooks contain fraudulent data. Why don't they have the integrity to take action and correct the problem. 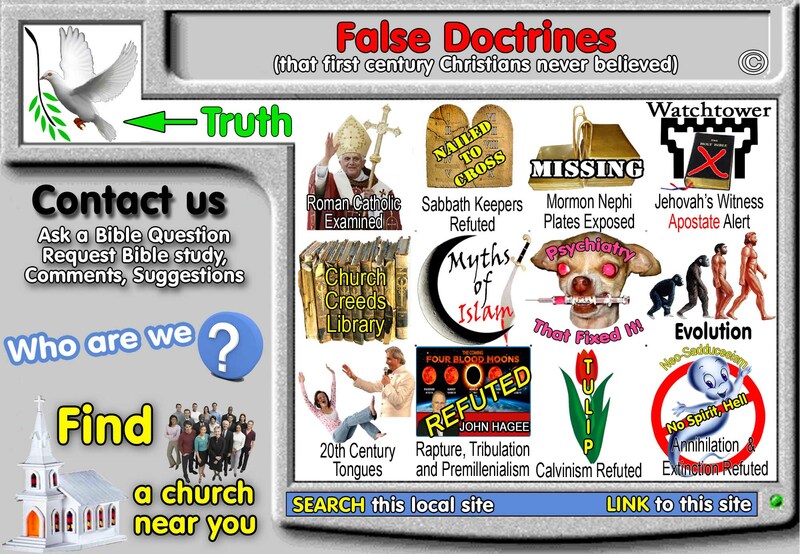 A single phone call or letter from any leading evolutionist would correct these text books instantly, but they don't really care how people come to believe in the faith of evolution, as long as people believe! But the fact is, that 2-4th year university textbooks in this current year use Haeckel's drawings and are no more up to date than High-School textbooks. Remember, university textbooks are just as bad as their high school counterparts as we have documented. Evolutionist argument: Embryos still look very similar! "The embryo of the mammal, bird, lizard, and snake and probably also the turtle, are in their early stages so uncommonly similar to one another that one can distinguish them only according to their size." 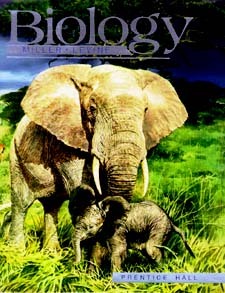 (K. E. von Baer) Stated differently: Embryology is no longer a major support for evolutionary biology. It is the comparative anatomy tradition (homology) that has come to the front. Evolutionist argument rebutted: Once championed as absolute proof that evolution, embryology today has been demoted to the valueless low level of "homology". (Similar looking structures) But homology is an argument used by creationists because a common creator would use similar design structures to accomplish similar things. Just as all automobiles use almost identical design structures because there is only one BEST WAY to something. So when embryos have heads, tails and "folds of skin" this superficial similarity is the most embryology can prove. Looking at the arm skeletons of various species accomplish the same level of proof embryology does. Homology is proof of a common designer, not evolution. Evolutionist argument: Similarities in embryo development support the concept of common descent. Evolutionist argument rebutted: The structural and biochemical similarities that exist in living organisms are no more evidence of a common evolution than of a common designer [God]. Similarities in embryo development support the concept of common designer. The argument that similar looking structures in embryology is proof of common evolution, is no stronger than the argument for a common designer. As impressive as "homologous embryology" sounds it is identical to looking at the "arm" of a full grown cow, dog and sophia Loren: homology. They look the similar: Proof of a common designer. Evolutionist argument rebutted: The manipulation of "Hox genes" provide no evidence of macro-evolution (change between kinds). The results of experiments have recently confirmed that manipulating Hox genes merely shuffles the same information in a new way. The typical result is that a leg forms from a different part of the body and all changes are destructive to the creature. But lets illustrate. Identify what would correspond to Hox clusters in the newest Windows operating system. What if we viewed the code of the current Windows and saw a "vestigial" Hox cluster of code from the old windows 2.0 way back in the prehistoric time of 1988. The common code is clearly the result of a common designer using well designed modules not some random evolution. Click here for a discussion on Hox Genes. Take the so-called "yolk sac," for instance. In chickens, the yolk contains much of the food that the chick depends on for growth. But we, on the other hand, grow attached to our mothers, and they nourish us. Does that mean the fetus's so-called "yolk sac" can be cut off from the human embryo because it isn't needed? Not at all. The "yolk sac" is the source of the human embryo's first blood cells, and death would result without it. Now here's an engineering problem for you. In the adult, you want to have the blood cells formed inside the bone marrow. That makes good sense, because the blood cells are very sensitive to radiation damage and bone would offer them some protection. But you need blood in order to form the bone marrow that later on is going to form blood. So, where do you get the blood first? Why not use a structure similar to the yolk sac in chickens? The DNA and protein for making it are "common stock" building materials. And, since it lies conveniently outside the embryo, it can easily be discarded after it has served its temporary-but vital-function. Notice, this is exactly what we would expect as evidence of good creative design and engineering practice. Suppose you were in the bridge-building business, and you were interviewing a couple of engineers to determine whom you wanted to hire. One fellow says, "Each bridge I build will be entirely different from all others." Proudly he tells you "Each bridge will be made using different materials and different processes so that no one will ever be able to see any similarity between the bridges I build." How does that sound? Now the next fellow comes in and says, "Well, out back is your yard and I saw a supply of I-beams and various sized heavy bolts and cables. We can use those to span either a river or the San Francisco Bay. I can adapt the same parts and processes to meet a wide variety of needs. You'll be able to see a theme and a variation in my bridge building, and others can see the stamp of authorship in our work." Which fellow would you hire? As Dr. A.E. Wilder-Smith pointed out, we normally recognize in human engineers the principles of creative economy and variations on a theme. That's what we see in human embryonic development. The same kind of structure that can provide food and blood cells to a chicken embryo can be used to supply blood cells (all that's needed) for a human embryo. Rather than reflecting time and chance, adapting similar structures to a variety of needs seems to reflect creation. The yolk sac actually reproduces the essential first blood cells for the new individual--an activity that is functionally quite different from the bird egg yolk. 2. If the presence of a yolk sac in mammals proves evolutionary history (they were once egg layers), then the presence of placentae in egg laying fish and reptiles proves mammals are their ancestors. For example, careful experiments have shown that the epidermis ANYWHERE on the embryo can form a limb if the appropriate developmental signal is given. The fact the (same) signal is given in different segments does not mean that vertebrate limbs are not homologous. The limbs themselves develop from the exact same tissues in each of the embryos you cited, and develop into homologous bone and tissue patterns. Ken Miller responding to my homology argument of limbs growing from different sections. Evolutionist argument: Most biologists first learned that Haeckel's drawings were frauds in 1997. We changed our textbooks as soon as we learned of this. Proof that textbooks in use this school year engage in classroom fraud. In use April 2000 2nd - 4th year biology at McMaster University. "FIGURE 23.1 (Fish, Salamander, Tortoise, Chick, Hog, Calf, Rabbit, Human): An illustration of von Baer's law: three stages in the development of several vertebrates. All the vertebrate classes share many common features early in development; many distinguishing features of the classes and orders appear later. (From Romanes 1901.) (Evolutionary Biology, Douglas J. Futuyma, Third Edition, 1998 ISBN: 0-87893-189-9, p 653)"
"FIG. 27-4 Embryonic stages of diverse vertebrates. Note similarity in the external features of early embryos of all vertebrates." "13-4 Evidence from Living Organisms: Fossils of extinct organisms are not the only evidence that shows the ongoing process of evolution. All living organisms bear traces of the history that links them to their ancestors. Additional textbooks that use Haekel's drawings not featured on this website.